“Should I pack up or wait for a while? It will likely get windier as the day progresses.” I took my time deciding as I slept in for a while. When I looked at the river I decided to give it a try. After launching I was wishing I had been paddling earlier, but as the river turned the wind and waves built. I found a spot to land next to some reeds. After tying the kayak to some willows I find a nice shady spot in dry, dead grass. There I lounged and read. In mid afternoon the wind seemed to let up a bit. I was antsy to make miles so I launched. The waves were definitely smaller. But then the river turned directly into the wind and the waves grew. As Chris Hansen had warned, the bank was lined with rip-rap, and a railroad track, with rip-rapped shore as far as I could see. That would make it hard to land without damaging the boat on the rocks if the waves got bigger. Ahead was a place where the bluffs receded from the shore. There should be camping across the track. I stepped out in knee deep water and carefully lifted one end of the kayak out of the water at a time, onto the rocks. When I climbed up to the tracks there was a lake on the other side! !&$@#. Ahead 1/4 mile were some trees. There should be camping. I carefully launched, and several hundred yards later cautiously lifted the boat out again as the waves did their best to crunch the boat against the jagged rocks. 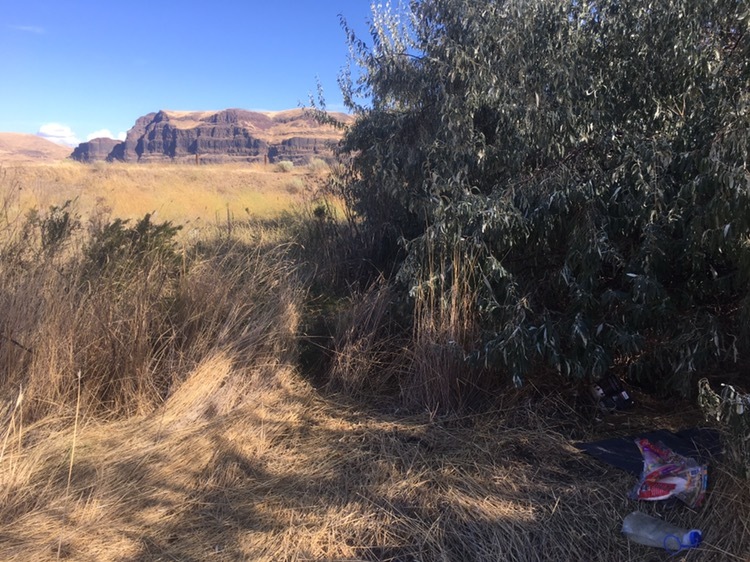 I loaded my pack and a garbage bag and went to check out the camp-spot. It was nearly ideal. The long, tall dry grass was flattened. It was well away from the tracks with a nice spot to set up the tent out of the wind and in nearly all-day shade. There were no roads. I’d have this place all to my self. Back at the river I emptied the last items from the boat and carried it up farther where I tied it off in case the wind got crazy strong. I’d done about eight miles. Better than nothing. What a beautiful, scenic site! No roads led here so I wouldn’t see anyone. What had flattened all the grass? There were many old animal and fish bones, a can with teeth marks in it, a tattered piece of webbing, as well as part of an old soccer ball and tennis ball, both chewed up. I’d wondered what big animal had dragged those big fish out of the water over by the tracks. I think cougar kittens had been playing here a few weeks back! That explained the fish, the deer bones, and all the chewed up “toys” they’d gathered while the mother hunted. The balls had floated down the river. It made me smile to look at all those chewed up toys and all the flattened grass and think of the mock fighting and tugs-of-war that had gone on! Camp. Note chewed up volleyball. I slept great. There was a good soaking rain last night. Hopefully it was widespread, it’s been mighty dry and I’ve passed many wildfire burns. I’d planned to spend the whole day here with winds predicted to even stronger. They were. Although I’d have preferred another big day of paddling progress I was happy to be stuck in one of my favorite campsites of the trip. One downside was no coverage to get caught up on answering emails. 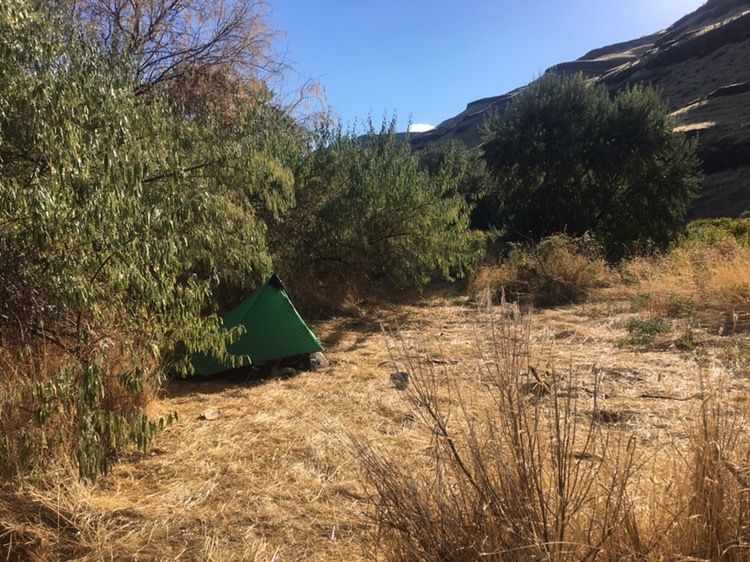 I put out my solar chargers and reread most of “Outlaw Platoon.” When the sun finally reached my tent in the afternoon I just went to a nice shady spot around the corner. I also took several naps, something I rarely do under normal conditions. I had plenty of food and polished off a box of Girl Scout cookies Chris had given me. It was a very pleasant little vacation with no packing or unpacking all day long. In the evening quail called from the bushes. Crickets sang loudly.